Hey Everyone - Barb here. What happened to the month of JUNE?? I cannot believe today is the 30th! The Fourth of July is just right around the corner! Summer is half over already! 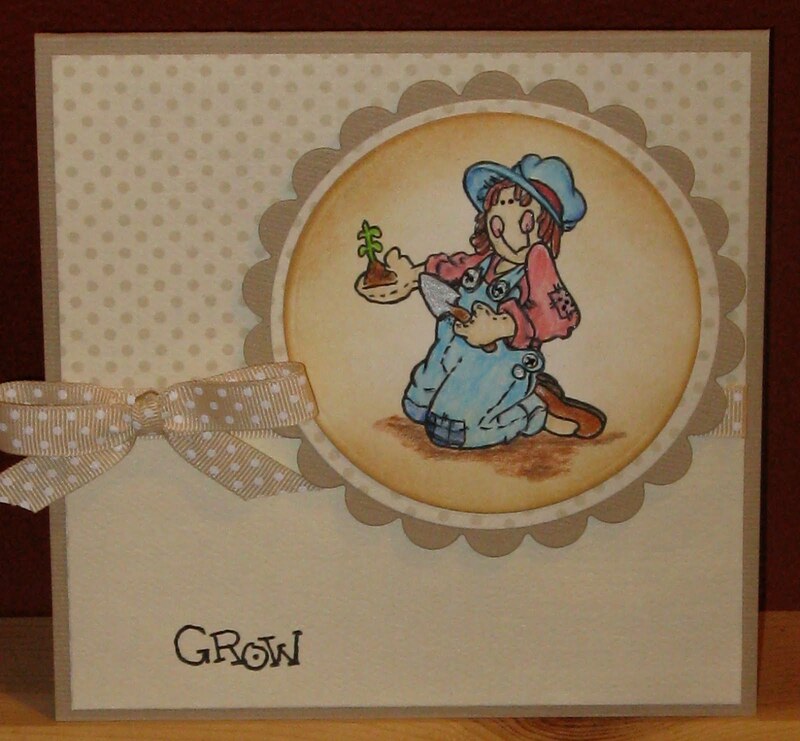 With that said - I would like to close out the month of June with a card I made using planting a garden and how does your garden grow? I first started with a white circle and gently distress it with Antique Linen Distress ink. I added Tea Dye around the edges. I then stamped 'Gardening' in black ink. Colored with my colored pencils, keeping the colors soft so it looked a little more aged. so I used my Bo Bunny swiss dots paper in two coordinating shades. I love how soft and pretty this turned out. I had a matching ribbon so I used that as well. 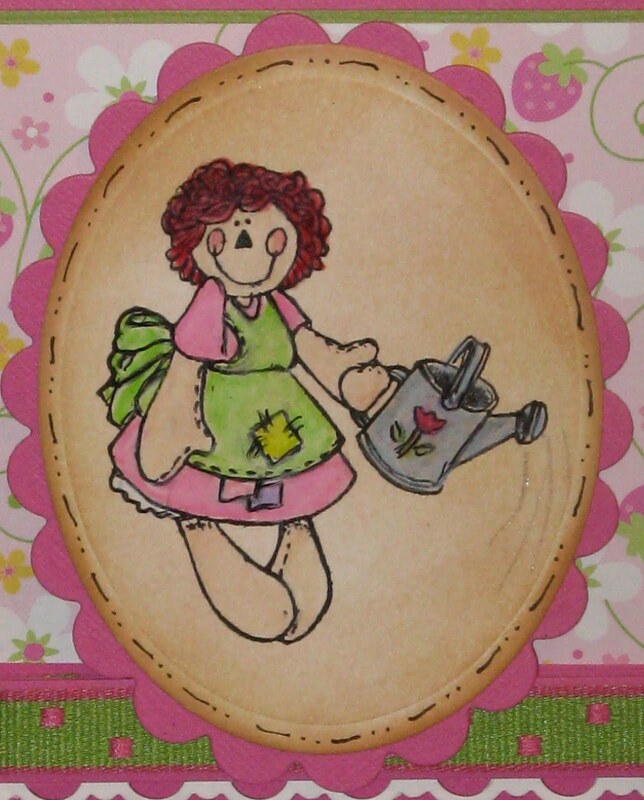 I masked the Garden Grow stamp to just use the word 'Grow". Thought that expression sort of fit with the ragdoll's expression. This is such a fun stamp. I've really enjoyed working with it! Now next month our theme will be CHRISTMAS in July!!!! I'm looking forward to seeing what our wonderful design team has come up with. Stay tuned to this blog for more information! 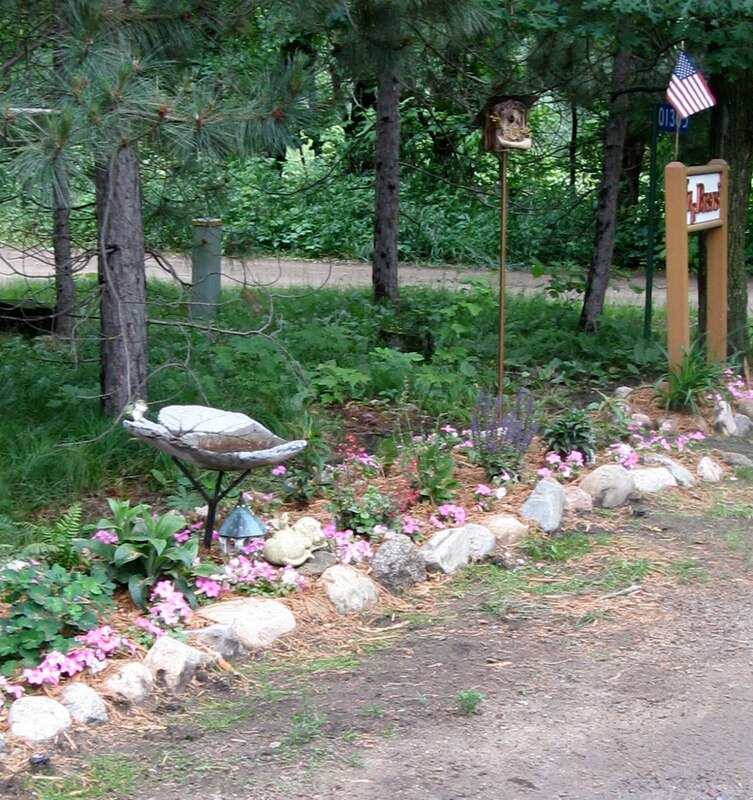 I'm adding a picture of MY garden (Harley's Garden). It has grown so much in the past weeks due to the huge amount of rain we have gotten! Harley's Garden one week ago. Ah summer! My favorite time of year! Hope to see you all back here in July! There will be a blog hop that you won't want to miss! Hi everyone! It's Jerusha here, excited to be posting on the QKR blog today! I hope you all had a wonderful weekend. We went camping this past weekend and spent three days in the sun, running after our two little boys and now I can say that I am pretty much exhausted! But, at the end of the camping trip, as I was taking the boys out of the car and going into the house, I looked at them and thought...wow...they really, really need a bath! And then the idea for this card was born! How cute is this stamp? I used Bubble Bath for this card, and it was so fun to play with! I used a Sakura stardust pen on the metal of the bucket to make it look a little shiny, and then I couldn't resist using some stickles on the bubbles to make them a little sparkly, too! You can find this stamp and many others in the QKR Stampede store. There are lots of cute and fun stamps there, truly something for everyone. Go have a look! Here is a card using the fish and the lure. I matted on a paper that has a mottled water look, and then on navy and cream. The fish is stamped on watercolor paper and embossed in black, then watercolored. I just love the Cow stuck on the moon. Such a cute stamp which can be used for most events, like birthdays, babies or even encouragement cards. I stamped her on white cardstock and watercolored the image, cut it close and popped it on a starry background and used the Eleanor Roosevelt quote. 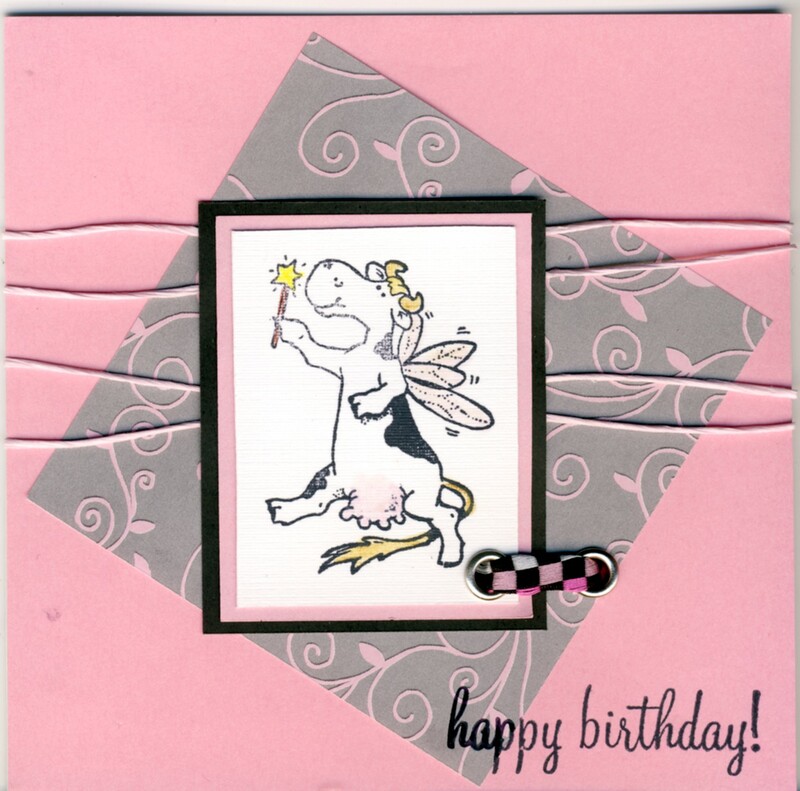 I also used tiny yellow star brads on the corner of the starry paper. cardstock. I used a little strip of black scallop just to finish it off. I am so happy for Friday to finally be here. Seems like my week had been so busy. Now that the kids are involved in all the summer activities it seems like I am busier than ever. What happened to the "Lazy" days of summer? Ha! 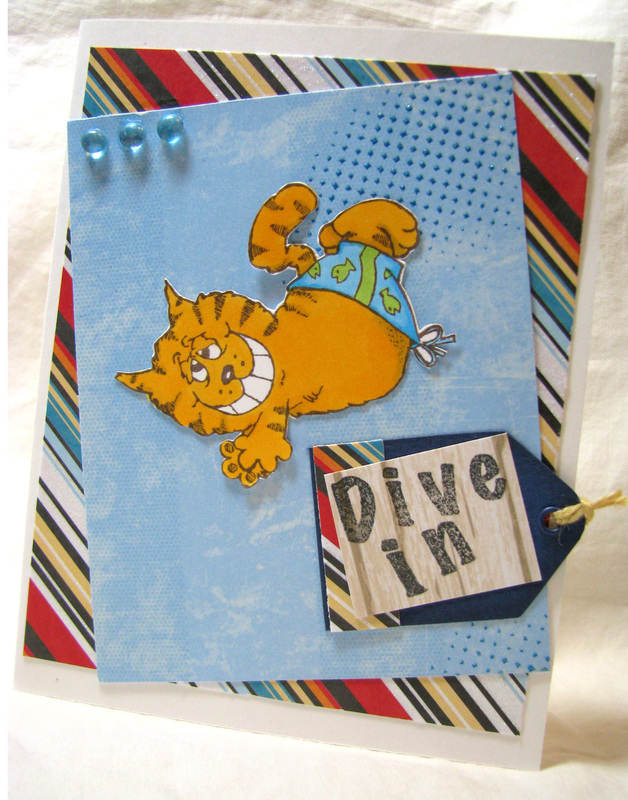 In all the excitement of the week I did manage to get a few cards done all about summer fun. The first one I used this cute stamp swimming kitty. He was so quick to color in. I just love his silly smile. 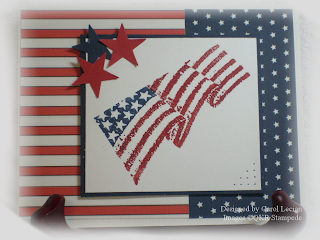 The second card I created is all about the upcoming 4th of July celebration. When I first saw this butterfly stamp I knew I was gonna have to have it! 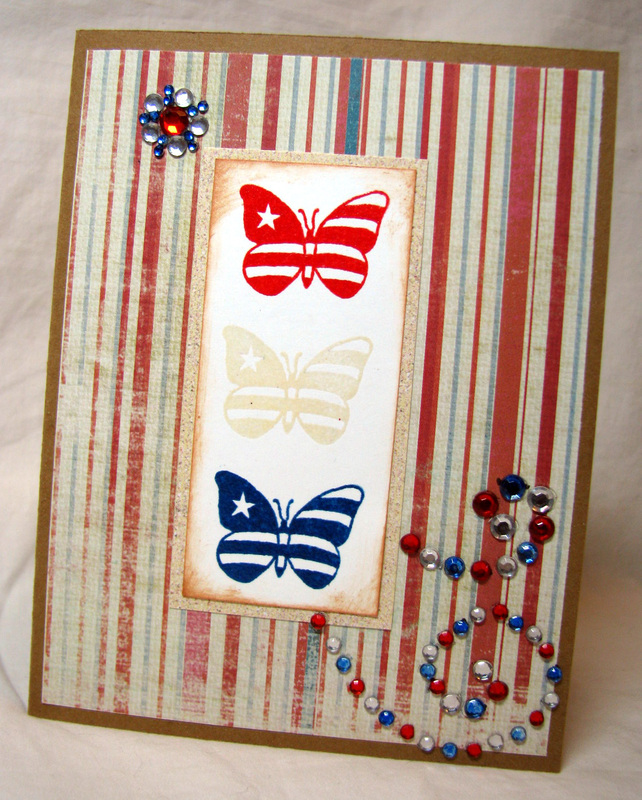 It is called Patriotic Butterfly. Isn't it great?! I stamped the image 3 times and embossed them. I love the look and versatility of this stamp. Hi there...Jessica here today. Hope you are all having a wonderful summer so far. My family is into "cheap" summer activities. We actually own some property about an hour from our house, so we spend a lot of time there camping all summer long. We recently found a spot to fish there too...thanks to the beavers that dammed up the creek...lol. Well today I wanted to share a camping themed card with you. I just love these ant stamps. There is a whole bunch of cute ant images in the QKR Store. If you haven't stumbled upon them yet...be sure to check them out HERE. I think they are perfect for summer. I used the ant roasting marshmallows image for this card. I colored him with colored pencils and trimmed him...which wasn't easy...lol. He is very detailed. I added some liquid applique to the marshmallows to make them look puffy and toasted. For the base of the card I used white CS, and layered the blue PP onto that. I thought it looked like a starry sky. I tore the edge of the green CS, and did some ink distressing to it. The camper I cut using my Cricut, and added some striped PP to the windows to look like curtains. Did you ever notice camper curtains always look retro? LOL! I also added a little moon. Well, that is all I have for you today. I hope you take the time to check out some of the other cute ant images in the QKR Stampede store, as well as the many other cute and quirky images. Hi everyone, this is Laralee and I cannot believe that it has been 2 weeks already. Next week is the 1st of July already, where has the year gone? Well I made this card for a friend that was just saying that she felt like a prisoner in her own house, and I thought that she needed a pick me up. Both the saying and the image are from QKR Rubber Stampede and I just had to have them. 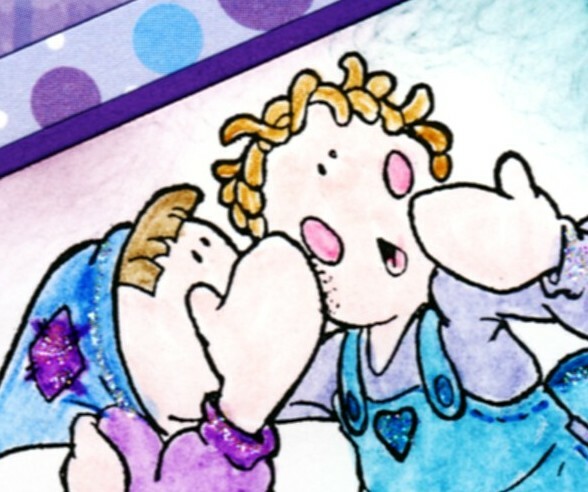 I used white card stock to stamp them and then colored them with my copics. I wanted to used somewhat muted colors......and I am hoping that achieved a good look. The background paper is some of my stash that I have had forever, and seeing how my wonderful husband has put me on a paper ban until I use up some of what I have (besides I am really trying to go green) I found this paper and loved it. Hope that everyone has a great day (maybe even dry here) and if it is wet in your part of the country.......stay in and CREATE. Carol, here, with another QKR project . . . and no history tidbits today! 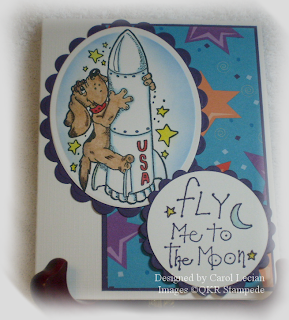 My project today features the Rocket Dog (#12404) and To The Moon (#11801) stamps by QKR Stampede. Rocket Dog was stamped with Ancient Page Coal Black Waterproof Dye Ink and colored with Prisma watercolor pencils and a blender pen. Memento Summer Sky was sponged around the image. To The Moon was stamped with Stampin' Up! 's Elegant Eggplant ink. 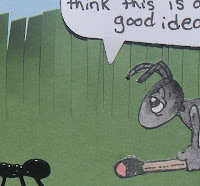 If you want to see another card made with Rocket Dog, check out this post at my blog. As always, thanks for stopping by today and spending some time with us here at QKR Stampede. Have a great day!! Just finished the hop. What wonderful, creative stampers in this group. Got lots of great ideas. I don't have a blog or belong to Facebook, but I've got all these ladies in my favorites. Nice job everyone! Hi there and thanks for stopping by! This is Ceal and I am sharing a great summer card with you using the stamp New Family. This is a great stamp to use on moving, housewarming or could even be used as a baby new addition card. Other supplies are October Afternoon papers and Labels 4 Nesties, added a ribbon and flower from my stash. This Raspberry Label stamp from QKR Stampede is just gorgeous. 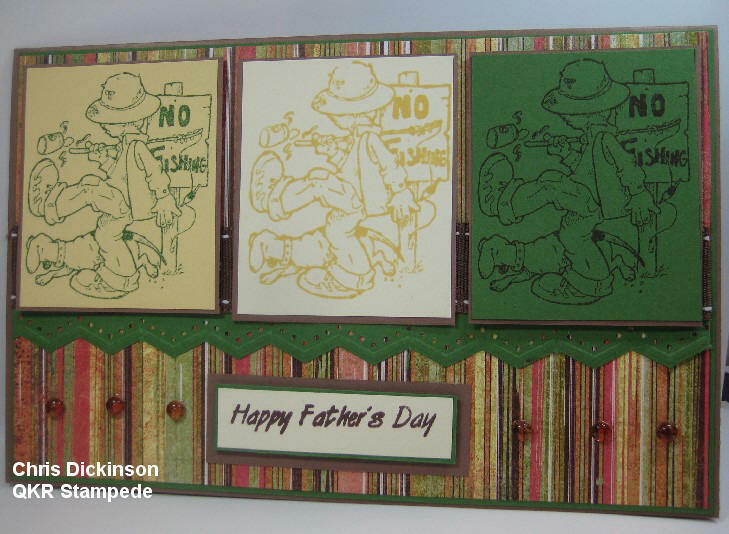 I combined this with the Thank You stamp (also from QKR Stampede) and Card Patterns Sketch 68 to create this quick card. 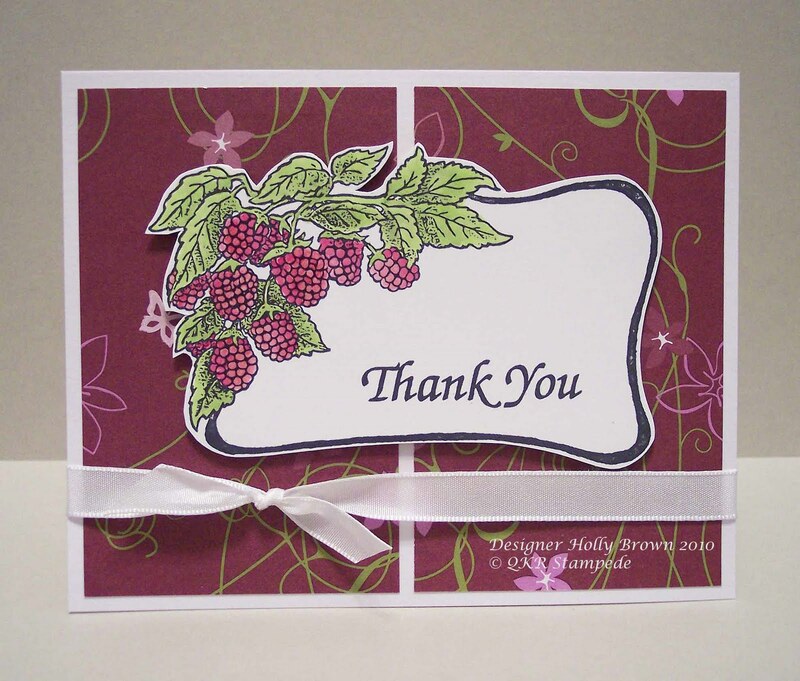 There are times when you just need a quick thank you card, and this one certainly fit the bill. All I had to do was color in the leaves and berries and then cut it out (less than 15 minutes). The sketch from Card Patterns was perfect for this stamp. I kept the layers minimal and I only used a simple white ribbon for an embellishment so the raspberry label would stand out. If you type in "label" in the search box on QKR Stampede, you will see all kinds of gorgeous label stamps. Roses, mason jars, raspberries, and apple blossoms adorn different label shapes. I need to collect all of these! 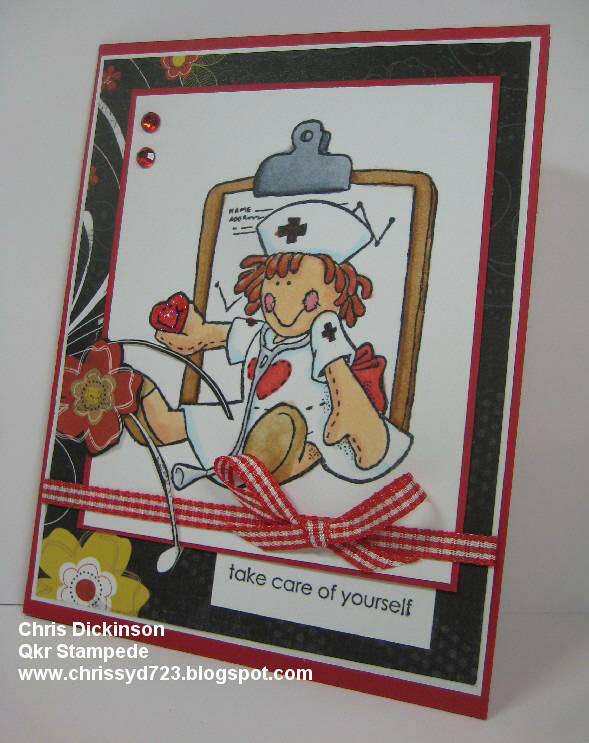 Did you know that QKR Stampede offers all their stamps as digital images as well as rubber?? This is an exciting new development! Now you can have QKR Stampede digital images within minutes of ordering if you are impatient like me. :-) Happy Shopping! Hello QKR fans ! It's Wednesday and it's my turn to post! This week my card features 13710 Watering and 12407 Garden Grow. I'm trying to think summer here in rainy Minnesota. I used my oval nestabilities to cut an oval from white paper. Then I distressed the white paper with Distress inks to give an aged look. 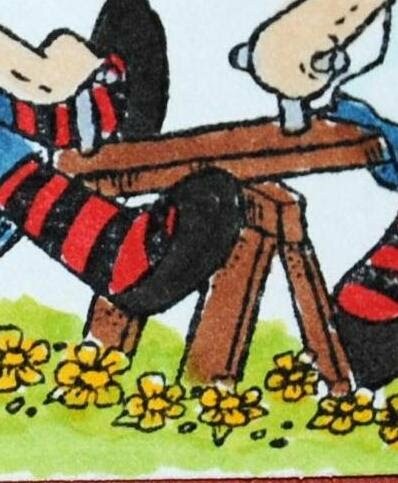 The ragdoll is stamped in black then colored with colored pencils. Then I layered it onto a scalloped oval cut from pink paper. A little doodle-ing around the edges give the oval a little definition. I made my card a 5 1/4" square card. 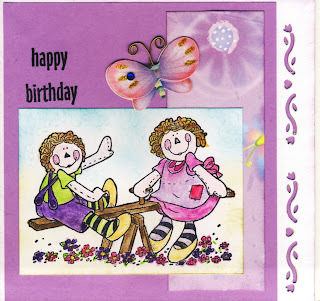 The background paper is from Doodlebug. If you click here I have another card posted at my personal blog using the same background paper but in a different color. 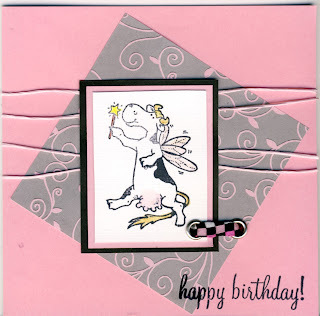 That is one thing I love about these stamps - they are very versatile!!! to bump it up so it didn't get lost against the bright pink card. The pretty ribbon I had in my 'stash'. Just a nice and summery card! Hope you will leave a comment. Hello! This is Chris...Are you getting ready for summer??? I know I am! We have had rain the past several days, and I heard from the weatherman the sun is going to shine the rest of the week...so I am thinking, we may go to the beach! Thank you for taking a closer look! Have a great day! Today is Flag Day (it is also my brother's birthday!). 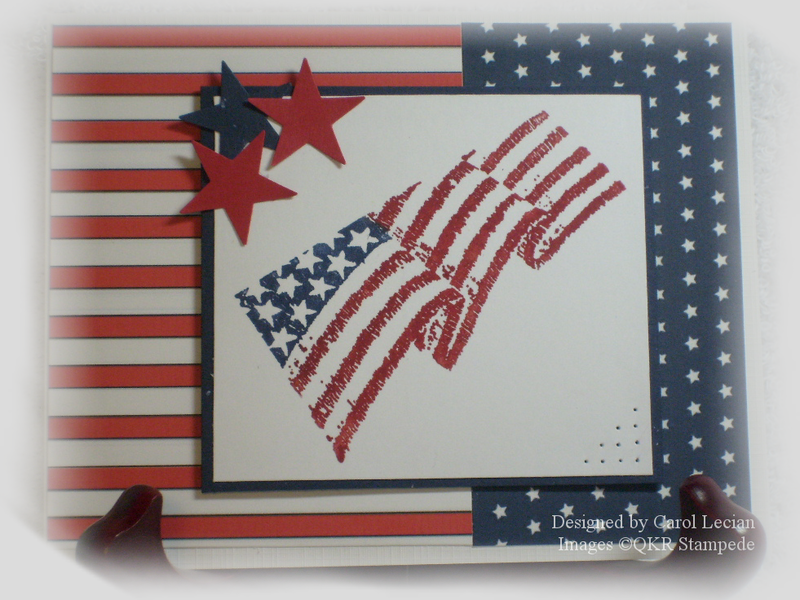 My project today, in celebration of Flag Day, features the Waving Flag (#16112) stamp by QKR Stampede which is represented by two cards. 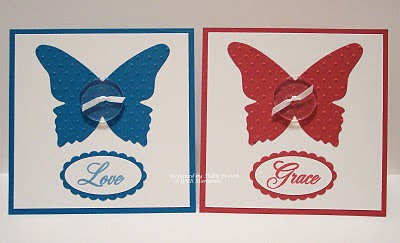 Two different card layouts using the same stamp image. Here, also, is a brief little history about Flag Day. Flag Day commemorates the adoption of the flag of the United States by resolution of the Second Continental Congress, which happened on June 14, 1777. As far back as 1861, several individuals and organizations played crucial roles in establishing a national Flag Day celebration. The first official observance of Flag Day occurred in 1885 at the Stony Hill School in Waubeka, Wisconsin, and was lead by 19-year-old grade school teacher Bernard J. Cigrand, who is credited with being the "Father of Flag Day". Mr. Cigrand gave 2,188 speeches about the flag and patriotism and wrote hundreds of magazine and newspaper articles advocating the recognition of the adoption of the nation's flag. In 1916, President Woodrow Wilson issued a proclamation officially establishing June 14 as Flag Day, and in August, 1949, National Flag Day was established by an Act of Congress. 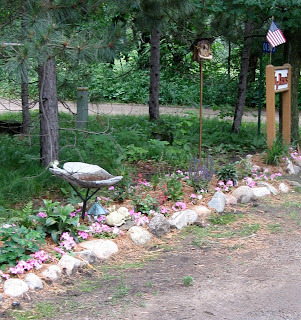 The National Flag Day Foundation, based in Waubeka, Wisconsin, holds an annual observance for Flag Day on the second Sunday in June with a ceremonial raising of the flag, recitation of the Pledge of Allegiance, singing of the Star Spangled Banner, a parade, and other activities. I hope you enjoyed these fun facts about Flag Day. To be honest, I didn't know that much about Flag Day, except that it was also my brother's birthday, until I did a little research. Thanks for stopping by and spending some time with us today. Have a great day!! WELCOME to the QKR Stampede "Summer/Patriotic" Blog Hop! We are so excited to show you what we created for this FUN Blog Hop and SO glad you have come to join in on the FUN! 3. For another chance, become a Fan on Facebook,HERE. The Deadline for entry will be Wednesday, June 15th at midnight EST. I will announce the winner on Thursday, June17th. Now on to some INSPIRATION from our talented Design Team! Hi there...Jessica here today. I hope you are all geared up and ready for our big June Blog Hop tomorrow. Starting right here! 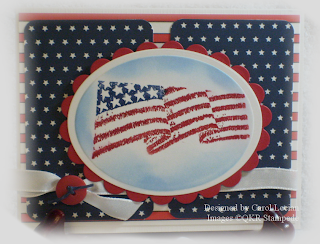 Our talented design team ladies will be showing you some Picnic and/or Patriotic themed projects. Trust me, you won't want to miss this! So be sure to stop back tomorrow and see all the eye candy these wonderful ladies have to show you. Today I wanted to share a quick CAS card for you. I recently learned how to make these adorable folded shirts out of PP. I thought it would be an adorable father's day card for my hubby. Here is my card. I used some PP I had laying around...oh and this works best with double-sided PP. I used some twill ribbon to make a tie, and added a little button to the shirt also. There really is so much you could do with this folded shirt! 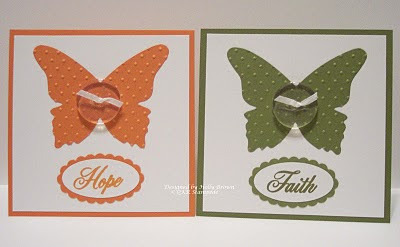 If you would like to know how to make them yourself...stop on over to my blog HERE and there is a link to a great tutorial in my post of this same card. I added this sentiment from one of the great QKR Stampede sets. This set is called Happy Birthday, and actually comes with 4 "holiday" greetings. 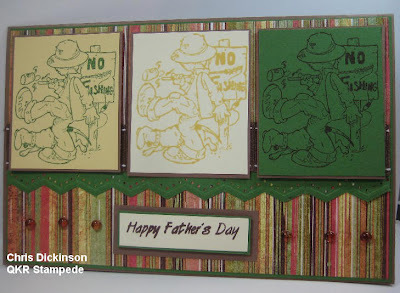 This is just one of the many great sentiment stamps in the QKR Stampede STORE...so many more great ones to choose from. That is all from me today...but be sure to stop back tomorrow and hop along to each of our blogs and see the great summery cards we have to share with you. Here is a little sneak peek of what you will find on my blog tomorrow! Wanna see more? Well hop on over tomorrow! I am posting for QKR Rubber Stampede today and boy am I excited. 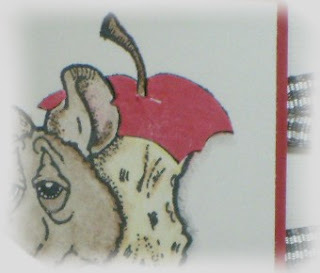 Number 1 I love playing with their rubber stamps and secondly WE ARE HAVING A BLOG HOP THIS WEEKEND!! Isn't that exciting. We need everyone to come and see what the DT has been doing. OK OK OK now for my post. I used my teepee stamp and stamped it out using StazOn black ink, I used white cardstock )because I am old fashioned and white goes with anything) then I used a patterned paper from SEI that I had and used my CM wave cutting board. Then I colored the teepee with my copics (I know what a shock). Then I wanted to do something inside and I found this digi from Stamp-N-Doodle that just screamed at me that it would match. I loved the way that this card has turned out. I was going to do it as a birthday card, but I am not sure yet and it is so versitile that I can use it for about anything. Well that is all for me TODAY, just wait until this weekend. Here is one of my June stamps. I sorta wish I saved this "cute lil lion" for my hubby for Fathers Day because the saying was so cute. 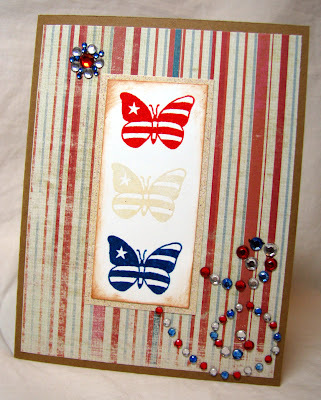 :) I'm working on a couple more cards for this upcoming Fridays BIG Patriotic blog hop. I can't wait to see what all the ladies make! Sorry I didn't show up on the Saturday I was supposed to, I misunderstood and thought it was the following Saturday. Oh well..... The card didn't turn out good anyhow. It's 2:00 AM now, and I am sorta lost on words right now, so I will see you Friday on our blog hop, hopefully your all as excited about it as I am. Today I feel just about as sleepy as the bear on this card! But somehow, the bear is a lot cuter than me while sleepy...especially when I haven't had any caffeine yet! For this card, I've used the stamp Napping Bear. It was really easy to colour in and then embellish. There are tons of awesome stamps like this in the store. Go check it out! Good Friday Morning! It's Ceal here and its my day to share a card with you. For my card I used this beautiful Rose Label stamp. This stamps is so versatile, you can stamp any sentiment in the inside of the label and it is adorned by beautiful roses. It makes a great CAS card. Have you seen this Love Faith Hope set over in the QKR Stampede store? I had to have this as soon as I saw it, and here are some quick and simple cards using each of the four words. I love seeing sets of cards in different colors, and that is what I've done here. 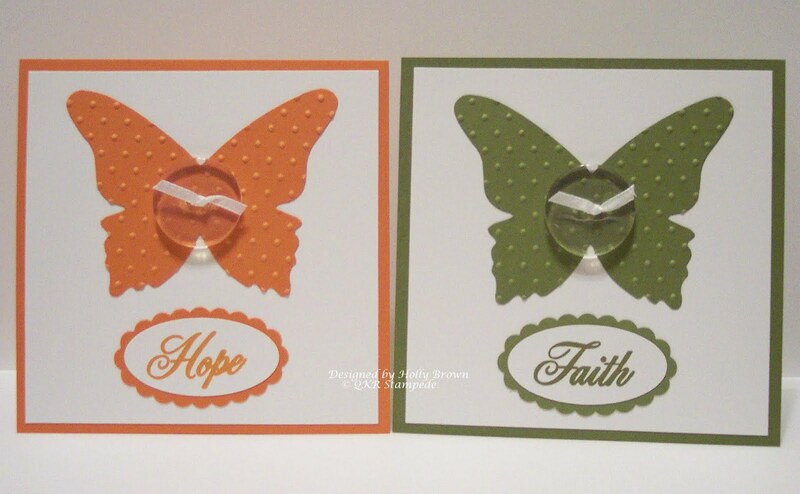 I chose to use some bold summery colors - Olive, Pumpkin, Teal, and Riding Hood Red from Stampin Up. 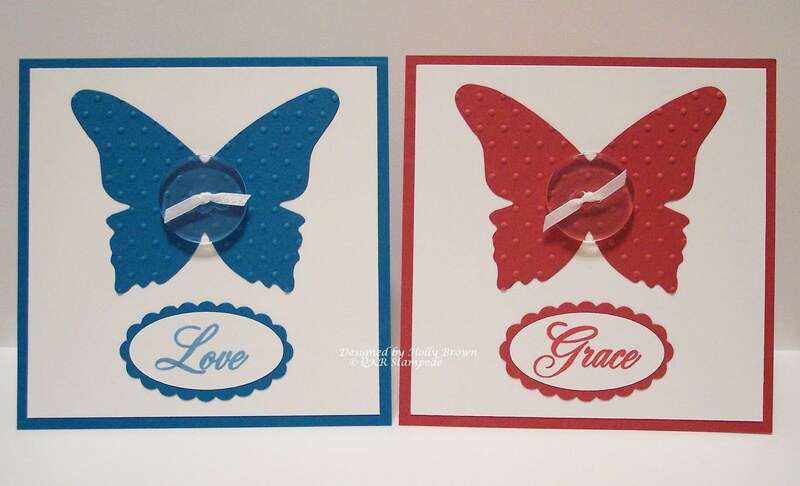 The butterfly is die cut and then dry embossed with the Swiss Dots embossing folder. I stamped each word and then punched it out with an oval punch and matted them with a scallop oval punch. Instead of using pearls or bling for the butterfly bodies, I decided to go bold and chunky with large clear buttons. I tied them with some tiny white ribbon (1/8") and adhered them with glue dots. Welcome to the Wednesday edition of the QKR blog! Today's card features going fishing. I've had fun with this stamp! 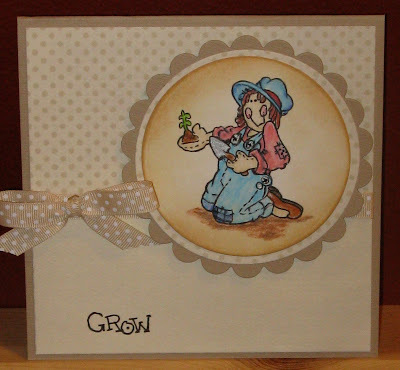 The design of this card is based on a sketch I found at The Sweetest Thing's blog. Because the design was fairly simple, I decided to jazz it up by using bold colors and texture! I used two different embossing folders. I then stamped my image onto the dark terra cotta paper. I really like how the coloring turned out. It seems to have so much more dimension when colored onto a dark paper. We love it when you leave comments so we know you visited! 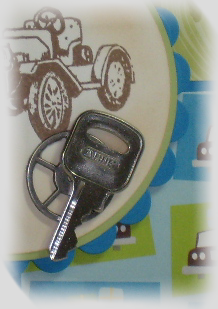 Stay tuned to this blog - I hear there is going to be a new blog hop soon!!! 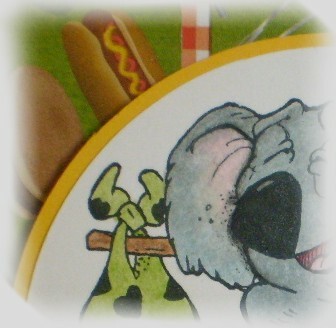 To see more of these adorable stamps, visit QKR Stampede's shop! Hello! I hope this finds you ready and refreshed after your holiday weekend! This is Chris from Wisconsin and I am here to share a card with you! 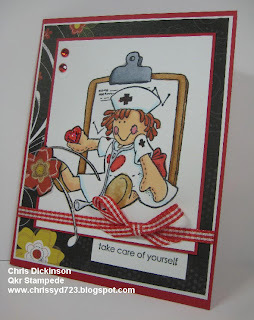 Splitcoast Stampers had a challenge yesterday for the Clean and Simple Challenge and we were to make a card for a HERO. I thought of the many, many nurses who have helped others selflessly, working long hours, listening to people complain and nursing them to better health.